You might have glanced at the above image and thought, 'cool, The Test Pit are reviewing the DJI Mavic Pro drone'. Well, sorry to disappoint you, but a Mavic this quadcopter certainly ain't. 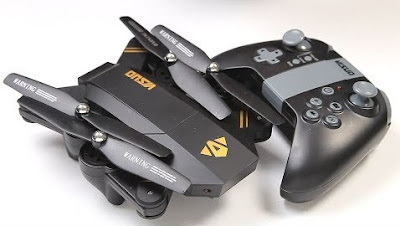 Enjoying a cheap plastic quad with knock-off styles and a few more features than we were expecting, we check out the Visuo Siluroid XS809W Quadcopter. So yeah, Visuo have very clearly ripped off the looks of DJI's popular folding photography drone, and they've even made the Visuo Siluroid XS809W foldable too; albeit in a less than sophisticated manner. The four pylons swing inwards to make the actual drone as compact as possible, and its actually pretty thin overall at only 6cm tall. As well as the travel-handy design, the Visuo Siluroid XS809W also boasts a camera... just nothing comparable to the real Mavic's 4K shooter. This quad has a tiny 0.3MP camera up front, but also WiFi to stream the live feed from the cam to your smartphone. 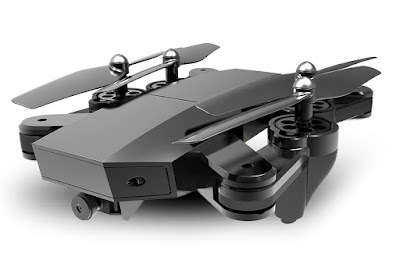 Just like the JJRC Elfie Selfie Drone (which itself was ripping off the Zerotech Dobby) you can use the UFO controller app to connect to the camera and then record what it sees direct to your phone, basically like a screen recorder. 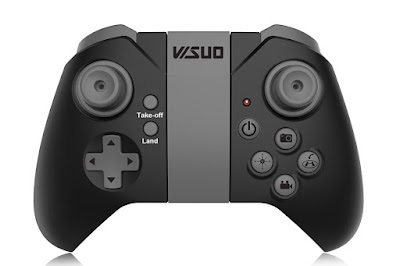 There is another, ever so slightly more expensive, version of the Visuo Siluroid out there, one that features a better camera AND the ability to insert a Micro SD card to record the footage directly, but this isn't it. Instead, you can only save the stream, meaning any interference and signal loss will also be captured. So this definitely shouldn't be used to film your entrant into the Cannes Film Festival. But, what it lacks in camera skills, it makes up for in handling. There is a built-in altimeter, meaning it will happily hover all by itself. There is also an auto take-off button on the controller (which features an expandable clip for your phone) so with one press the drone will rise to about four feet and stay there, awaiting directions. There's no GPS of course, not at this price, but it still stayed quite still, depending on how strong the wind was blowing. The flight range for this thing was a fairly standard 100 metres or so, but the WiFi link degraded completely at about half that. Again, no worries if you're just having a fly around, but not great if you're trying to capture a selfie from the air. 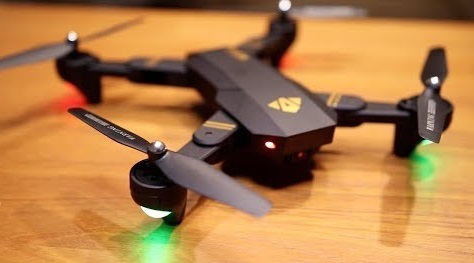 However, visuals on the app or not, the Visuo Siluroid XS809W was fast - faster than we expected - and stable in the air. There is also a return to home function, and headless mode should you get disorientated during flight. All in all, we actually really enjoyed flying it. That fully plastic body is tough enough to withstand a few crashes (you get an extra set of props and also prop guards in the box), but because it is very much a smooth-flying, short-range quad, the chances are you're not going to crash it too badly. And carrying it is a breeze thanks to the folding design. Just saying. 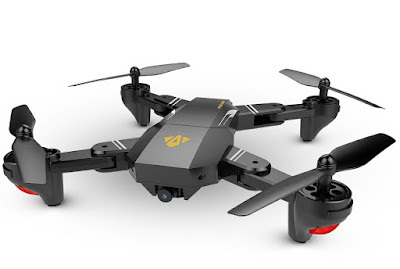 So yeah, this definitely is not anything approaching the DJI drone after which it styles itself, but as a cheap, fun, practice quadcopter, the Visuo Siluroid XS809W ticks all the boxes.